I was in the Navy during the War serving on H.M.S. Cairo (pictured above) when in 1942, Brentford played Portsmouth at Wembley, in the war-time F.A. Cup Final. I couldn’t attend as I was stationed in the Mediterranean around Gibraltar but my father went to the game and somehow managed to get the whole team to sign a programme! As something special, he posted it to me but it took two or three months to reach the boat. I couldn’t believe it when I saw it – I was so pleased. Everyone on board was really interested, as both teams were quite well known in those days. I was very proud of my programme. Shortly after, in August 1942, we went on an important convoy taking oil and provisions to break the blockade of Malta. We were one of a very large number of ships. 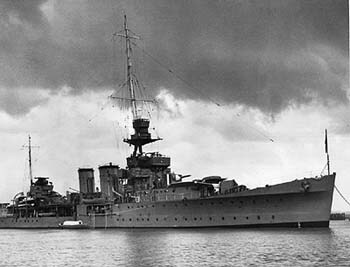 On August 11th, we were struck by an Italian torpedo and the H.M.S. Cairo began to sink. I tried to rush down to the office where my precious programme was but it was on the wrong side of the bulk head and the water was rising – I just couldn’t reach it. The ship was sinking. Everyone was abandoning ship but all I could think about was saving the programme but sadly, my unique programme went down to the bottom of the Med. along with H.M.S. Cairo, where no doubt it still lies. All was not quite lost as my father had kept another copy of the programme but it was not signed and was obviously not the same. It is still one of the rarest F.A. Cup Final programmes because after matches, supporters handed programmes in as part of the War-time paper recycling effort… But I really wish I still had that signed one! As a lad, I played for the local Scouts. A proud coincidence led to anther connection with the game and made the programme even more precious – a fellow team-mate from that Scout team and my boyhood games – Les Smith – scored the two goals in that F.A. Cup Final that won the game. NextDo Deadline Day Dealings Leave Us Light Up Top? I love this article. It is of another time and another place. The thought of a sailor trying to retrieve his precious programme when the ship was sinking!!! Staggering. Wonderful ‘Boys Own’ stuff.